IBIZA Guest House i Hue, Vietnam : Boka nu! 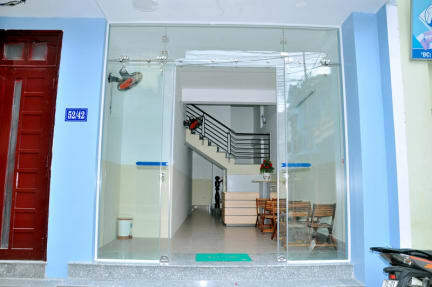 IBIZA GUEST HOUSE is located in the heart of Hue City with a cool and quiet atmosphere. 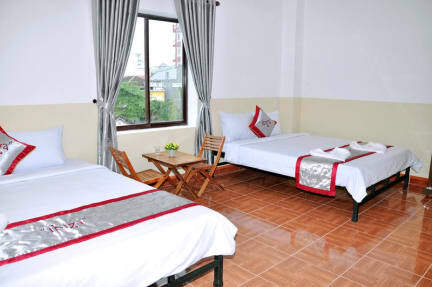 Guests can walk to the poetic Huong riverside and the Trang Tien bridge in a few minutes. Within a radius of some hundreds of meters round the hotel are banks, post office, stadium, Eurasian restaurant, shops, trade center and leisure center. Service minded and friendly staff. Private rooms are large, but toilets are bare minimum and and you can literally take a shower at the same time you do your business at the toilet. Doors for the rooms have mosaic windows and will let lights in. They are also super thin so you here everything that is happening outside and in the lobby, but once everything calms down I had a great sleep. Breakfast menu is unusually large. Renovation near by, nothing mentioned during check in.